Fresh paint may look great in a nursery, but harmful paint fumes will continue to off-gas in your home long after the paint has dried. Use low- or no-VOC paints and finishes. (If you are concerned about old lead paint, have the walls sealed.) If you’re stuck using conventional paint, make sure there is plenty of ventilation while working and give the room plenty of time to air out before the baby sleeps there. Finish all the hard renovation (including painting) at least eight weeks prior to the baby’s arrival so that any residual fumes and airborne particulates can clear from the air. High pile carpets will capture dust mites and other contaminants, which can compromise a nursery’s air quality. Suitable floorings are hardwood floors or laminate floors, but make sure they aren’t manufactured or applied to the floor with toxic chemicals. If you choose to install wall-to-wall carpeting, select a tight, low pile “green” brand of carpeting and be sure to use low-VOC adhesive. Anything that can accumulate dust (drapes, blinds, stuffed animals, etc.) can impact the air quality. HEPA vacuuming and using HEPA air filters are great ways to reduce indoor air pollution as they remove airborne particles as small as .3 microns in size, including pollen, pet dander, mold spores and dust mite allergens. Purchase hypoallergenic rugs so they can be washed frequently to cut down on dust and airborne allergens. Washable curtains are also a great idea. When choosing a crib, keep in mind that the railing, once the child can stand, often becomes a chew toy. Make sure it’s made of formaldehyde-free woods and VOC-free finishes. Avoid buying pressed-wood products (i.e. particleboard and other composite woods), which generally contain formaldehyde, a known carcinogen. 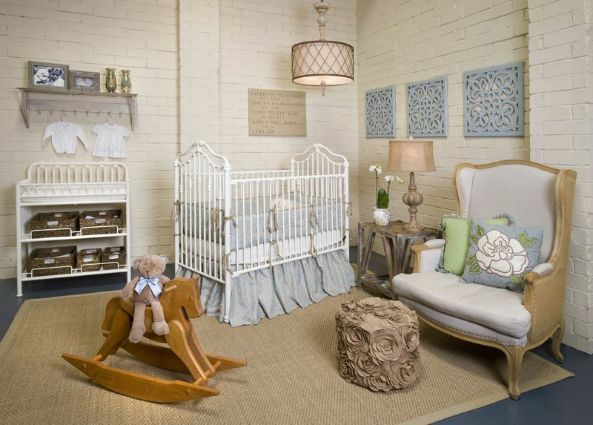 Look for cribs, changing tables, dressers and rocking chairs that are made of solid wood and coated with non-toxic finishes. Or, consider buying used pieces. Most of the off-gassing occurs in the first six to 12 months of the furniture’s life. However, if possible, avoid buying or accepting a used crib. Older models might not meet current safety standards or might be faulty or missing parts. If you do accept a hand me down, check to see if it’s been recalled and then inspect it. TIP: When shopping for furnishings, look for certifications like GreenGuard, which identifies products that have lower chemical emissions. Many parents-to-be are unaware that conventional mattresses are typically made with synthetic materials that can break down and release harmful chemicals into the air, like polybrominated diphenyl ethers (PBDE). Since your newborn will spend the majority of his or her time sleeping, it is especially important to use a natural crib mattress. Latex, organic cotton and organic wool are all great options. 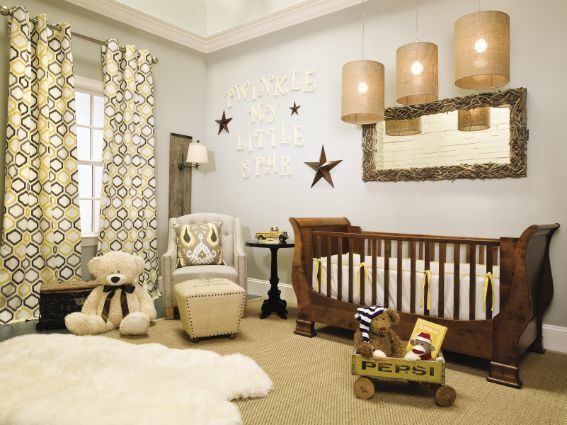 Keep pets off the crib and out of the nursery. Clean the air with houseplants. A study by NASA found that in addition to absorbing carbon dioxide and releasing oxygen, a number of houseplants do an excellent job at removing harmful contaminants from the air, such as formaldehyde, benzene and carbon monoxide. Some of the top contenders are: lady palm, bamboo palm, English ivy, dracaena “Janet Craig,” golden pothos, philodendron, Boston fern, peace lily, and spider plant. Open a window. Even if it’s chilly outside, you should open a window for even five minutes a day to “air out” the concentrations of indoor air pollutants in your home. Most home heating systems, including forced air heating systems, do not mechanically bring fresh air into the house. So, open a window and start breathing cleaner air.